The next transport logistic—International Exhibition for Logistics, Mobility, IT and Supply Chain Management—will be held from May 9 to 12, 2017 at the Messe München site. 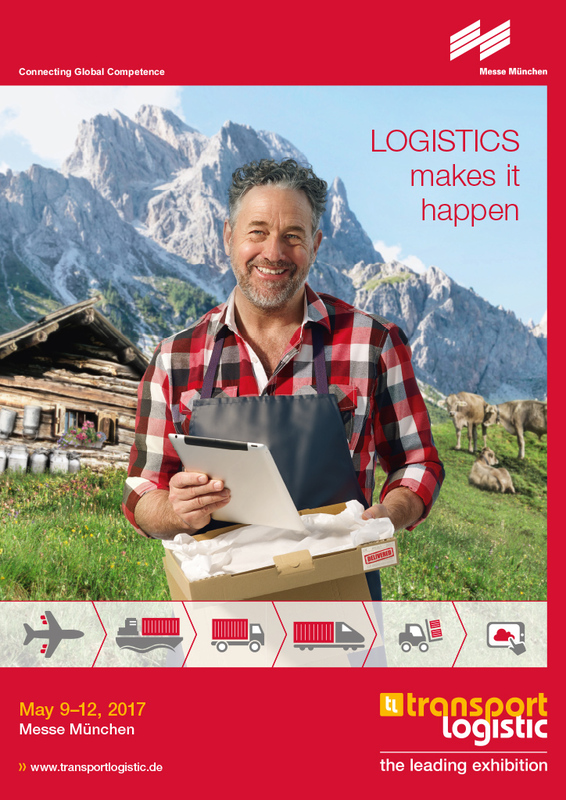 Logisticians are problem solvers, overcoming challenging tasks every day. And it is these special feats that are to be conveyed by transport logistic’s key visual and stand as a symbol of the industry. Whereas the image of the 2015 exhibition was the Inuit woman admiring tulips against a backdrop of snow, the focus in 2017 is on the alpine farmer. For transport logistic 2017 the thinking behind the delivery of a product as the central theme was taken a step further. The tablet computer exemplifies the fact that digitization is the driving force behind the logistics industry, and will remain so in the years ahead. Only logistics and supply chain management afford even remote locations the opportunity to partake of international value chains. As such, logistics brings prosperity and growth. The Alpine farmer as well controls production via his tablet—the message is: efficiently digitizing processes, pro-moting networking and greater integration of mobile terminals. The exhibitors at transport logistic 2017 will demonstrate just what else is possible thanks to logistics. “transport logistic is the key trade fair in the logistics and supply chain world. It showcases today the solutions to the challenges of tomor-row. This is why transport logistic is the world’s leading industry get-together, attracting providers, users and experts from the world of logistics, mobility, IT and supply chain management. Exhibitors at this pro-innovation platform benefit from intensive contacts and networking”, said Gerhard Gerritzen, Member of the Executive Board. As a source of stimulus to the industry, transport logistic 2017 is the most im-portant port of call for answering topical issues and showcasing innovative solu-tions. The supporting program features large in this. Country specials provide specific insights into individual regions. Moreover, special offerings for the indus-try’s young talent make transport logistic an excellent venue for recruiting. You will find additional information about transport logistic 2017 on our redesigned website. You will find images for your reporting at http://www.transportlogistic.de/trade-fair/press/newsroom/photos-logos/index.html and on the relevant event webpages.